From the exciting inaugural project in 2009, which was aptly named Urban-Eyes, to 2010’s Greening Our Lives which resulted in 3 winning schools realizing their murals as Public Art in Craighall Park, Diepsloot and Orange Farm, to the celebrated Mandalas for Mandela in 2011 which went on to enjoy 3 exhibitions including one at the Nelson Mandela Centre of Memory, to Joburg: 2040 an astonishing project which saw learners actively imagining the future of the City of Johannesburg inspired by the Growth and Development Strategy for the City in 2012, to the impactful Corridors of Freedom in 2013, this schools visual arts programme has become an integral part of the City’s flagship Johannesburg Arts Alive International Festival. Imbali has been at the helm of this initiative from its inception, implementing the project in schools across the 7 regions of the City. 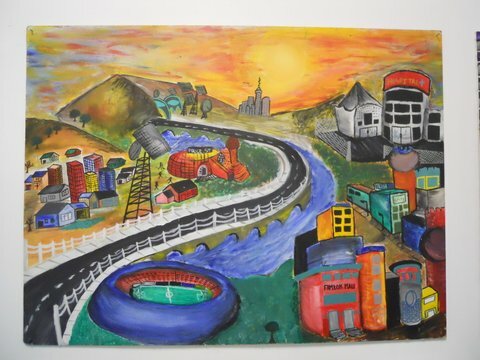 From Orange Farm to Craighall Park, from Newtown to Diepsloot, primary and secondary school learners have been inspired to produce truly remarkable artwork, clearing illustrating the enormous value of projects of this nature to young artists in the City of Johannesburg. 2014’s project was titled Metaphors of Freedom in 3-D and was a celebration of South Africa’s 20 Years of Freedom. 22 participating schools created mobiles giving expression to this evocative theme. “Breathtaking would be the perfect description for these artworks,” said Lesley Hudson from Arts Alive, “because mobiles really do move on a breath of air. By their very essence they express an extraordinary sense of freedom. The gentle movement sees them dancing, floating, freely changing positions with endless possibilities.” The mobiles were exhibited in the Joburg Theatre’s upper foyer during the Johannesburg Arts Alive International Festival in early September. In 2013 The Arts Alive International Festival once again commissioned Imbali to implement the schools programme. The project was entitled ‘WALKING THE CORRIDORS OF FREEDOM’ and 22 schools participated from the 7 regions of the City of Johannesburg (CoJ). The COJ is using “Corridors of Freedom” to describe a number of projects it will undertake to make Joburg a freer, safer environment with transport, access to amenities and quality living for all. 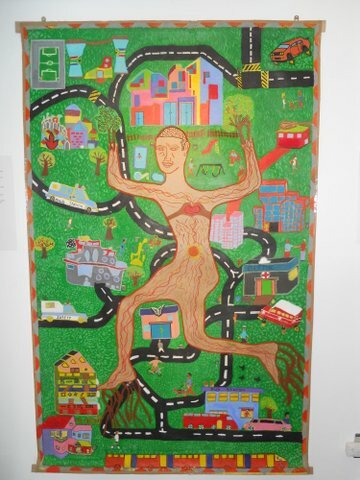 Each participating school worked with Body Tracings, capturing exuberant, energised human beings living optimally in a City that has their needs at the heart of their spatial vision and planning. The “traced” individuals show a balance of mental, physical and emotional well-being and prowess. These are 21st Century Giants able to prosper and fulfill their promise. The works were exhibited at Origins Centre at Wits University from 6 to 25 September 2013 and at the Sandton Convention Centre for the Art Fair from the 26-29 September 2013. 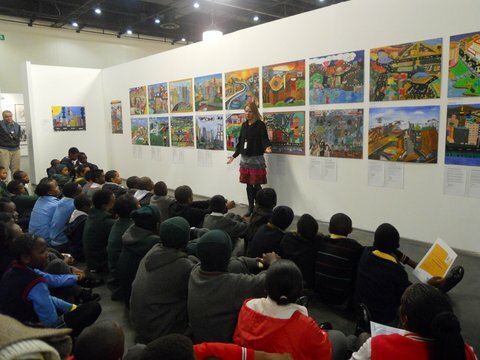 Building on the firm foundations of the Imbali / Arts Alive Schools Visual Arts Initiatives from 2009 – 2011 (Urban Eyes – 2009, Greening our Lives – 2010, Mandalas for Mandela – 2011), 2012 marked the 4th project helping to secure the longevity of this valuable visual arts initiative. The learners of 2012 will be the captains of business and social leaders of 2040. 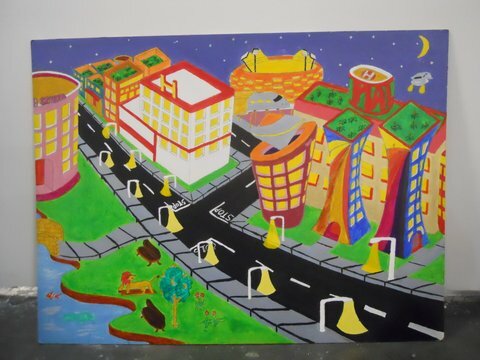 They were inspired to depict their visions for the city of Joburg in 2040. Through these art works they gave artistic colour, texture, nuance and shape to the concepts of a smart City, a Livable City, a Resilient City, a Social City and a Competitive City. The possibility of a bright future starts with ideas, ideas of how things might or could be different, better. The ability to imagine, fantasize and creatively articulate these ideas is testament to the ingenuity and resilience of the human spirit. This year’s Arts Alive schools project has given the young participants space to imagine and invent a future different from the present; a future where Diepsloot has its own university, there are flying cars and an underwater hotel in Joburg and children can play safely in the city’s parks. The art works bear testament to the power of creative vision, the power of young people to creatively engage with a host of important questions around the future of our city, a future that is open to interpretation. 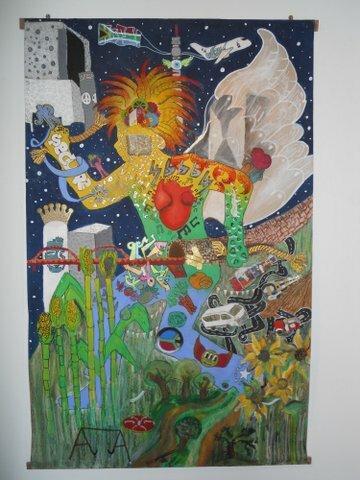 When viewing these works one is struck not just by the power of imagination and creativity, but the power of young people to take hold of what is in their imaginations and put this into images, images filled with colour, texture and pattern. Each artwork is made with care and thought as well as real insight into what the Johannesburg of 2040 needs. In 2011the Arts Alive/Imbali project was called ‘Mandalas for Mandela’. Mandala is the Sanskrit word for circle, representing wholeness which can also symbolise health and healing. This year the project involved 26 schools from the various Jo’burg regions (stretching from Orange Farm to Diepsloot). A group of 6 to 10 learners from each school created their own unique Mandala around the theme of HEALING. The theme greatly excited everyone and once the ideas around healing were brainstormed and developed into a Mandala design learners painted it onto canvas with a range of brightly coloured fabric paints. ‘I only have one question, when can we start?’ a boy asked after the project had been presented . This enthusiasm was typical of the eagerness expressed in the project. What distinguished this project from the previous years were two additional partners: The Nelson Mandela Foundation and Constitution Hill. The Nelson Mandela Foundation donated two books to each participating school: a comic book about Mandela’s life; and the book of Mandela’s quotes. Mandela’s legacy will provide valuable insight to the participants in relation to this project. The completed art works were exhibited at Constitution Hill. The opening of the exhibition coincided with the first week of the Arts Alive Festival. 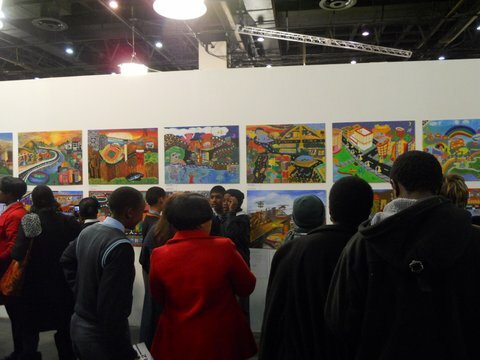 The exhibition was attended by 250 learners and their teachers from the 26 schools who participated in the project. The Mandalas looked beautiful all displayed together and the learners took great pride in seeing their artworks exhibited. The Imbali students also produced a wonderful Mandala at the last minute which brought the number on display to 27. Steven Sack from the City of Jo’burg opened the exhibition and Ahmed Kathrada, veteran anti-apartheid activist from the Nelson Mandela Foundation made the keynote address. Then one child from each school spoke briefly about their work. This was followed by a tea for guests and teachers and picnic bags for all the children. The afternoon went off without a hitch and feelings of achievement and festivity surrounded the event. The mandala designs were so beautiful that the Nelson Mandela Foundation has requested to display the entire collection of Mandalas at their office from December 2011 to February 2012. 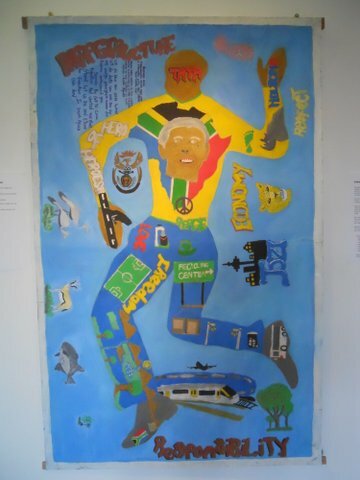 In 2010 the Arts Alive/Imbali project was called ‘Greening our Lives’. Working with found materials, learners from 25 Jo’burg schools created designs for mosaics engaging with issues of urban renewal, recycling, caring for our planet etc. These beautiful artworks were then exhibited at the Sci Bono science centre during the Arts Alive festival. Designs from two winning schools were then selected to be mosaiced onto a prominent wall within the school community.